Our app uses your Palm Pre or Palm Pixi’s GPS system to locate you and your contacts on the move in real time. This download is for Version 3.0.2 of the Cellflare App. For the release of 3.0.2 for Palm, Cellflare the app will now run in the background. The Options allow a) to run the application minimized to the dashboard or b)to run the application completely in the background. An Auto Start with Timer feature has also been added for 3.0.2. For 3.0.2 Cellflare has redesigned the interface, graphics and registration process to create ease of use, clearer presentation and increased functionality. The key new feature is Friends on the Map. In addition Cellflare has improved the efficiency of its core tracking program which should allow for longer battery life. With Friends on the Map, users will now be able to follow and track all of their friends from their mobile device..Palm, Blackberry and iPhone. The information presented includes a photo or avatar of their contacts, their position, and average speed in real time. This will allow for Friends meet up with no more missed rendezvous that have plagued some location based services. Cellflare gives you the ability to locate yourself directly on your Palm using our live scalable map. This makes finding your way a whole lot easier as you can accurately navigate around the city in the palm of your hand using either the road, satellite or hybrid map view. All while letting your contacts locate you at the same time. They can do so by conveniently viewing all of their active friends, family and colleagues simultaneously in one view on our map. This takes staying connected to a whole other level. After downloading the app onto your Palm Pre or Palm Pixi you will need to go to cellflare.com and create a free account. Next you will use your 10 digit phone number and your unique 6 digit license key -given when you update your profile- to activate Cellflare on your phone. Now you are ready to add your friends and create your Cellflare social locating empire. Cellflare’s website map gives you instant visual reference of your online contacts, showing you who is out and about. 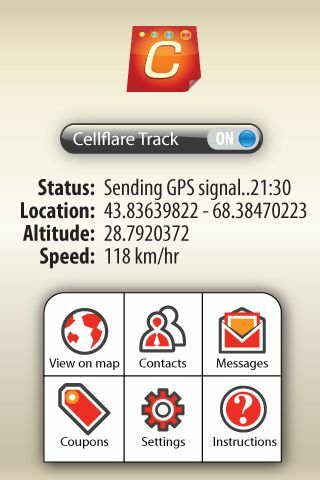 Not only does Cellflare work in real time it also locates users within 5 meters of their exact location. Each contact is displayed using a colored dot and their profile picture. Safety is a huge aspect of Cellflare; its features are designed to help give users peace of mind while on the move, making it a practical tool in today’s world. • Quick Locate allows unregistered guests to have a quick peek at a desired user’s whereabouts, with the user’s permission. • The History feature allows users to retrace their recent movements displaying their trips from A to B, showing the speed traveled along the way. • With the GeoFence, you can set a parameter around a certain location and receive email notifications when contacts enter or exit the set boundaries. • Friends on the Map shows your Contacts on the map on your mobile device in real time. Get ready to look and locate!